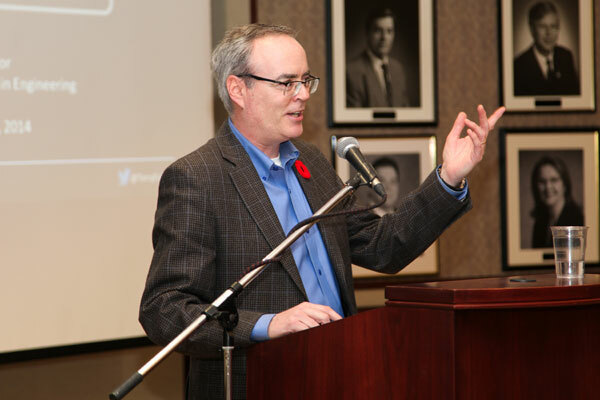 Best-selling novelist and trained engineer Terry Fallis gives a lively address at ILead’s lunchtime engagement (Photo: Sydney Goodfellow). How does an engineer write a novel? He builds a blueprint first, of course. That’s exactly what trained engineer and award-winning writer Terry Fallis does, designing complex characters caught in layered plotlines and meticulously mapping out chapter after chapter. Even though he’s never worked as a formal engineer, he thinks the engineer’s way of doing things is his secret to success. On November 6, the author of The Best Laid Plans, in which an engineering professor runs for Parliament to avoid teaching English to first-year engineering students,shared his fascinating career story with U of T Engineering. His message: no matter where your career takes you, an engineering degree will be of service and in demand. “I’m not so much a novelist as I am an engineer who writes novels,” said Fallis, whose roller coaster career includes success as a political strategist, public affairs consultant and a best-selling novelist. The hilarious lunchtime talk, hosted by the Institute for Leadership Education in Engineering (ILead), drew a diverse crowd of students, faculty and staff from across the Faculty interested in learning more about unconventional engineering pathways. 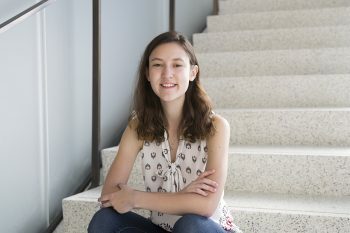 How could an engineering education prepare you to be an author? “I could not have written that novel or any of my novels were I not an engineer. 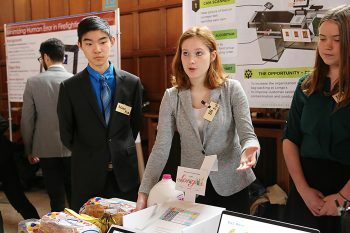 The methodological approach to problem-solving, the discipline, the work ethic, the analytical skills, the innate curiosity I think engineers are blessed with—these are all extraordinarily valuable in whatever career you’ve chosen,” Fallis said. Canada Research Chair Professor Aimy Bazylak (MIE) sat in the first row at the event to hear insights on being an engineer and an author. Learn more about writer Terry Fallis.